REALLY Fast-Eh? is a new and even faster platinum silicone FuseFX part Ã¯Â¿Â½Ã¯Â¿Â½Ã¯Â¿Â½AÃ¯Â¿Â½Ã›Â (Eh?). Use instead of regular part Ã¯Â¿Â½Ã¯Â¿Â½Ã¯Â¿Â½AÃ¯Â¿Â½Ã›Â. REALLY Fast-Eh? 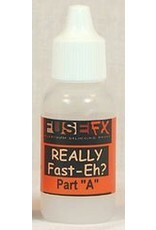 will give your FuseFX silicone paints a working time of 2 to 3 minutes and curing time of 8 to 10 minutes. This is especially useful when patient/model are wearing the prosthesis or prosthetic and touch ups are required. Adding a final micro thin coat of FuseFX Liquid Sheen will render the surface semi-matt without heavy powdering, bringing the shine down to a natural sheen. Really Fast-Eh? for airbrushing. A working time of 20 minutes can be achieved by mixing 1.5 to 2 parts solvent to 1 part of mixed FuseFX paint.